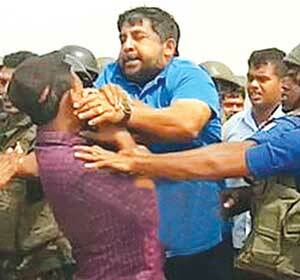 Everyone saw or knows what happened at the Hambantota harbour last week. The Tri Forces in 2009 had been proclaimed the greatest heroes of the country since Independence. The world applauded their brilliance in defeating the LTTE terrorists after 30 years of war and 100,000 deaths. They were probably the only SL organizations that were world class. Sadly however they have recently been under threat, not only by white eyes but also by their own (new) government that has co-sponsored an international resolution to try some of the Army for war crimes. Is there a conspiracy to demean them to achieve goals that are diametrically opposed to what they gave their lives for? It must be asked among other things, why the Navy Commander, whose retirement is due soon, himself, took over point man duties with his sailors in confrontations with protesting workers at the Hambantota harbour? Would any other Service Commander have done that during an industrial action? Was he expected to or had he been ordered to do so? Did he decide to be on the spot to inspire the sailors and ensure the ‘operation’ went off well by his presence? (If that was the case it was a dramatic failure?). Where was the immediate commander of the deployed troops? Was the Southern Commander present? What was his role in the presence of the Navy Commander as point man? Was there an overlap of command? Was the Navy Commander ordered to be physically present? If so, by whom and why? Did the existence of the International Ship and Port Security Facility Code, a post 9/11 development, that has been freely quoted, require it? The SLN is the competent authority to act if needed in terms of that Code. In India and the USA it is the Coast Guard. In others it could be the Harbour Police. On board a ship it could be one of many in charge, like a Chief Security Officer. Could the SLN been confused by the PM who last year in a rush of blood, quoting irrelevant law, stated that he would order the Navy to shoot Indian fishermen who cross the maritime border? Was the Navy overwhelmed when the PM said the SLN would take its place with the USN (that has a distasteful long history to make ‘America great’ by meddling with non-white countries) to secure the Pacific and Indian Ocean sea routes, even while China and Pakistan, our staunchest friends, were being side lined to say the least? The follow up visits by so many high profile visits by USN ships, including an Aircraft carrier and even a USN Maritime Reconnaissance plane and the elite US Marines, not to forget the INS ships must have rocked their minds. The Indian Navy collaborated. SL remembers that not so longer ago the latter dropped anchor opposite the Presidential Secretariat Office in Colombo (1987) in a ‘show the flag support’ of the criminal invasion of the IPKF and to give warning to any SL citizen who opposed the ‘Agreement’. This did not prevent a SL sailor from trying to hit the unlucky Indian PM Rajiv Gandhi’s head for a six when the latter was inspecting a guard of honour. The SLN has suddenly been portrayed as a national bully. Who is to blame? Most of the country wants the Navy Commander taken to task. He was, however been loyally defended by the popular State Minister of Defence. The latter went overboard and declared that what was happening was piracy. He elaborated that by doing so the strikers were no longer civilians but pirates. He added that the Navy was entitled to shoot at them. (Shooting unarmed people do not bring credit to any organization or individual). He over looked a vital fact, that piracy is defined as an act of robbery committed by pirates on the high seas. By some quirk of imagination he may have believed the harbour was in the high seas and unarmed strikers and journalists had become pirates. The PM as usual did not commit himself. Media Secretary Kalanasuriya, not to be overdone, took over. But becoming progressively hysterical, he waxed eloquent that ‘journalists should maintain ethics’ for the sake of mutual ‘security’. He warned that otherwise journalists risked being ’assaulted or killed’. It would appear that he then unintentionally contradicted what he had already stated, when he condemned the action of the Navy Commander saying ‘no one has an authority to assault others…’ What about ‘killing’? He is apparently merrily conducting an inquiry into the affair by questioning four other ‘journalists’ who had all unsurprisingly said that the journalist who was assaulted had breached a naval perimeter defence line. It boggles one’s imagination to believe that rural journalists can breach perimeter defence lines manned by SLN sailors, who not so longer ago demolished the feared Sea Tigers. His faulting the Navy Commander, however, was bereft of any inquiry and a contradiction. Did all these ideas confuse the Navy Commander as to the role of the Navy and himself that day? It certainly could have influenced him. Politicians are also fond of getting the Forces to pull their chestnuts out of the fire. Some made it an art for 26 years of the 30 year conflict. When it goes wrong, it is the servicemen who are left holding the baby with no known parents. The Commander of the Navy should never have appeared at the head of his sailors in an industrial dispute, even more so incognito in shorts and T shirt. (This has been defended as the dress of a harbor pilot)! He should not have at any point taken on a journalist (half his size) physically and opened himself to charge of causing simple hurt and acting like a bully. Was he, after a lifelong admirable service in a gallant Navy that inspired the Nation, exposed by some congenital weakness of character that made him go berserk and seek to impress not his subordinates but his cunning political masters? What a terrible descent. It is hoped that this incident will discourage others who may have been swayed by unprofessional ideas. Will the politicians, true to form, leave him to sink or will they offer him an almost expired life jacket? We live in trepidation. Was this an act of Royally misguided loyalty to the ‘Hearts of Oak’ traditions? Oak trees do not grow in SL so why does the SL Navy march to that tune and old boys of a certain school sing of it? Hambantota should not have been the Navy Commander’s Peterloo. Will it be a defining act of the age? We do not have Coast Guard and our Navy deals with maritime issues. IThe cause is the JVP terrorists interfering with international ships which got nothing to do with the protestors jobs or their politics. Do we expect “gentlemen” as Navy commanders ? We should not. They are to fight enemy. Crwods should be disperesed by Police, not Navy. If police annot handle then ( as it involved ships) it could be Navy. If Navy comes there they need not use “minimum force” ( that is police). He could have killed the Pattara Kaaraya. The writer of this article doesn’t address the really important questions. WHY WERE THESE SO CALLED STRIKERS OCCUPYING AND HOLDING HOSTAGE TWO GIANT CONTAINER CARGO SHIPS AND ITS CREWS AT PORT! No one seems to address that the answer to that question is that those strikers under international maritime law was illegally occupying two cargo ships. This means their act was a an act of piracy on the high seas as a technical definition. I can’t believe those strikers weren’t aware of the illegality of their action. They deliberately occupied those ships. To create an incident where the SL Navy would have no option but to act to clear these trouble makers from the decks of these ships so they can be on their way. It is also the duty of the Navy of the country these ships pass through that they are protected and free acts such as these. When these idiots decided to block the ships leaving they certainly knew they would force the SL Navy to act. When the mainstream media showed up. Lets face it some of these mainstream media types are a pretty obnoxious arrogant bunch. They must have gone upto the SL Navy commander and said they will report him in the papers etc. Just for doing his job which is to ensure those cargo ships pass unhindered. Naturally the SL Navy personnell lost his cool. They are probably already upset with the mainstream media for the way they taunt the SL military during and after the war. Now he shouldn’t have lost his cool. But all that happened is he roughed up the journalist. The journalist didn’t end up in hospital or worse. Read up what the UN Navy did to people who occupied a US cargo vessel MV Maersk Alabama in 2009 off the coast of Somalia. While a totally different scenario. It shows that the SL Navy could have used deadlier force if they wanted to, they just wanted to clear the decks of the ships. Credit for that should go to the SL Navy commander who only roughed up and uppity journalist whilst asking his troops to peacefully clear the decks of the two ships. Also the right action Ranil Wickeremasinghe in this instance. Those protestors had no business being on the decks of the cargo ships threatening the ships crews. That is the crux of the issue which nobody on this stupid forum seems to address. I for one applaud Ranis Wickremasinghe and the SL Navy commander and strongly condemn the protestors and the idiotic journalist who got in the SL Navy commanders way on a no doubt very difficult day created by these dumbass arrogant and dangerous protestors. If they wanted to protest they could have done it well away from the two cargo ships. Then I garuantee you there wouldn’t have been any SL Navy action. Ranil Wickremasinghe wouldn’t have had to call in the SL Navy to hambantota. The SL Navy commander with the war six years over would have been happy to continue to not be summoned and enjoy the peace and no war since 2009 without being summoned to deal with these protestor idiots. He definitely doesn’t want to be the centre of attention. But it seems the commenters on this forum and the writers are taking the side of these criminal protesters and that is a crying shame. I applaud UNP Ranil Wickremasinghe and the SL Navy Commander in this instance. Good on them. This entry was posted on Saturday, December 17th, 2016. You can follow any responses to this entry through the RSS 2.0 feed. You can skip to the end and leave a response.